On 27 April 2014, Pope Francis will canonize two of his predecessors, John XXIII and John Paul II. As the rules require, devotees have long been preparing for their recognition as saints, gathering biographical materials and evidence of miracles. This act brings the number of canonizations in his papacy to ten. But on 3 April, Francis canonized three lesser known Blesseds, two of whom were French-born Canadians, the other a missionary to Brazil born in the Canary Islands. In the case of these three saints and John XXIII, Francis relied on an equivalent canonization without miracles. The new round of saint making invites us to consider the role of miracles in the canonization process and ask if it is changing in our time. Below are five things you may not know about the canonization process. Saint-making was once a local procedure, overseen by bishops. During the Counter Reformation, the church codified the analysis of causes through a special committee, the Sacra Rituum Congregatione (SRC). Launched in 1588, these rules were clarified in the 1730s by Prospero Lambertini (1675-1758), who became Pope Benedict XIV in 1740. Three stages are necessary: first, veneration following an authoritative biography to establish a life of “heroic virtue”; second, beatification following miracles; finally, canonization following more miracles. In the Catholic tradition, only God works miracles. Therefore, miracles received after appeals for intercession are taken as evidence that the candidates for sainthood are with God. Elements of due, canonical process, miracles also illustrate how the faithful experience illness. Exemptions from miracles were allowed for rare individuals, especially martyrs—whose deaths were sufficient evidence of sanctity. Nevertheless, the Vatican archives holds many records of miracles ascribed to martyrs, such as the English and Welsh martyrs, Andrew Bobola, John de Brito, and the Jesuit saints of Canada. 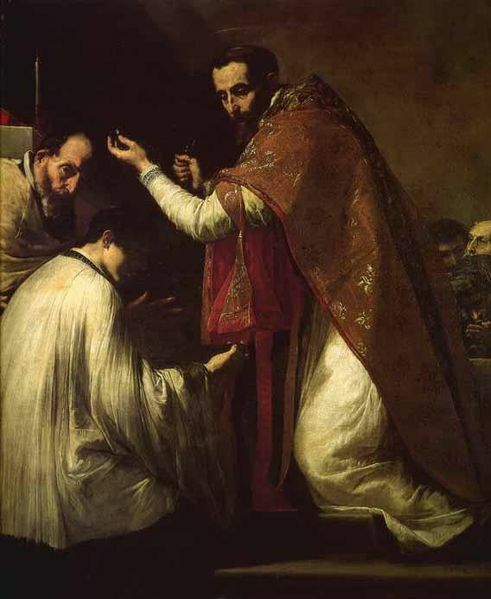 The Miracle of Saint Donatus. Amiens, Museum of Picardy. Public domain via Wikimedia Commons. (2) The majority of miracles over the last four centuries are healings from physical illness, for which scientific testimony is required. In my study of 1,400 canonization miracles over four centuries, more than 95 per cent were healings from physical illness. The proportion of “medical miracles” increased to 99 per cent in the twentieth century. Most investigations required testimony of physicians, some of whom were nonbelievers: treating doctors, expert consultants, and occasionally medical family members. In addition, the Congregation for the Causes of Saints (successor of the SRC) relies on a committee of distinguished physicians, the Consulta Medica, to evaluate the claims of postulants. Most investigations seek evidence not only that the patient prayed, but also that she appealed to physicians who used up-to-date diagnostic and treatment strategies. (3) Diseases that are healed miraculously change through time, reflect changes in science, epidemiology, and medical therapeutics. The diseases healed by divine intercession reflect the major concerns of any period: fevers in the early period; tuberculosis in the nineteenth century; cancer, neurological, and heart diseases in our time. Diseases healed by intercession often match characteristics of the new saint. For example, the first miracle ascribed to John Paul II was a French nun’s recovery from Parkinson’s disease. In the cause of Kateri Tekakwitha, whose face had been disfigured by smallpox, the final miracle was the survival of an American boy with native ancestry who suffered flesh-eating disease of his face. The committee of expert physicians examines every miracle submitted for consideration, assessing the diagnosis, the quality of treatments, and plausible, scientific explanations for the cure. If the diagnosis was unreliable, or the treatment short of contemporary standards, or the cure scientifically explicable, then the healing may be recognized as an act of grace, but not a miracle. (4) Saint-making and recognition of miracles has been streamlined. Many miracles were necessary for canonization in the past. Seventeenth-century causes saw an average of fifteen to twenty miracles. Benedict XIV emphasized quality and scientific scrutiny over quantity. Thereafter, the average number of miracles for each cause declined to approximately four, although some boasted many more. For much of the twentieth century, a cause could not be considered until at least fifty years had elapsed following the death of the candidate. Also, the would-be saint should have interceded for two miracles before beatification, and another two for canonization. During the papacy of John Paul II, the process was streamlined. The wait time was reduced to five years after death, and the miracle requirement, to only one for each of beatification and canonization. (5) The need for miracles in the canonization process may be on the wane. Gathering miracle evidence is expensive and time-consuming. Emerging nations rarely have elegant technologies, such as CT and MRI machines, demanded for exacting proof of diagnosis and healing. Finding witnesses and documenting illnesses long past is difficult. Some churchmen worry that the emphasis on miracles and up-to-date medicine poses an unfair and unnecessary hurdle for people of developing nations who should be entitled to venerate exemplary lives of local champions. In causes from 1588 to 1999, only three hailed from Africa: all beatifications by John Paul II on the basis one medical miracle each; one of these three, Sudanese nun Josephine Bakhita (d. 1947), was canonized in 2000. Similarly, some clerics are concerned that the emphasis on miracles skews the process away from its main mission: to celebrate inspirational, human lives. Miracles sensationalize a process intended to enhance the accessibility of faith in daily life. They also argue that emphasizing miracles downplays the intrinsic merits of prayer. Most people who pray do not receive miracles. Nevertheless, prayer provides consolation, comfort, insight, and strength. With his first canonizations, Pope Francis is bucking tradition in a manner consistent with his focus on person-centered simplicity. His April 2014 decision to canonize four saints without miracles is technically within “the rules.” But it bypasses the strict, centuries-old procedures of miracles in order to celebrate their intellectual lives, as well as their spirituality, by drawing attention to their contributions as educators and scholars for the disadvantaged. Miracles notwithstanding, saint-making is and has always been a product of politics and diplomacy between the Vatican and flocks of the faithful. Jacalyn Duffin is Professor in the Hannah Chair of the History of Medicine at Queen’s University in Kingston, where she has taught in medicine, philosophy, history, and law for more than twenty years. She has served as President of both the American Association for the History of Medicine and the Canadian Society for the History of Medicine. The author of seven other books and many research articles, she holds a number of awards and honours for research, writing, service, and teaching. She is the author of Medical Miracles; Doctors, Saints, and Healing, 1588-1999 and Medical Saints: Cosmas and Damian in a Postmodern World.